2000AD has been nominated for an Eisner Award for the first time. Last night, the weekly sci-fi and fantasy comic was announced as one of the five nominations in the ‘Best Anthology’ category. It is the first time that 2000AD has ever been nominated for an Eisner, which are named after ground-breaking American cartoonist and writer Will Eisner, and are the comic book industry’s most prestigious awards (web:www.eisnerawards.org). The winners will be announced at the famous San Diego Comic Convention in July. 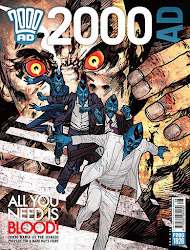 The editor of 2000AD, Matt Smith, said: “I’m delighted that 2000AD has been nominated in the Best Anthology category for the 2013 Eisner Awards, the first time in its 36-year history that its made the prestigious list. Other Brit-related nominees include artist Tom Gauld for his graphic novel Goliath, artist Sean Phillips, publisher NoBrow and writer-artist Luke Pearson.